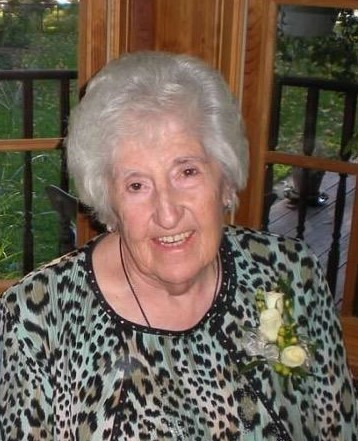 Frances (Murray) Dafoe, loving wife, mother, grandmother, and great-grandmother, passed away surrounded by her children and grandchildren on January 19, 2019, at the age of 89. Frances was born on September 14, 1929 to Mary and Martin Murray and grew up in Gooseville Corners. She married Robert Dafoe and they moved to Cortland, New York before settling in their home of many years in Little York. They had eleven children. Frances was preceded in death by her husband Robert (73) in December 2004 and her siblings and their spouses Elizabeth (Don) Rainbow and John (Jack) Murray, and her grandson Elliott Dafoe. At the time of her death, Frances was a grandmother to twenty-two grandchildren and nineteen great-grandchildren. Her home was always open and welcoming to everyone, and it was a perpetually lively and welcoming place. Frances seemed to have a heart that expanded with every introduction to each new child. Her large family was her life’s work and passion. She cared deeply for them all. Frances also loved dancing and old relics that held an interesting history. Beloved for her kind-ness, non-judgmental temperament, and wry sense of humor, Frances was quick, clever, and compassionate until the very end of her life. Frances is survived by her sister-in-law Judy Murray and her children Daniel R. (Nancy Avery) Dafoe, Maureen (Michael Dawson) Dafoe Dawson, Murray Joseph (Linda Wingenbach) Dafoe, Mary Frances Dafoe, John (Jack) (Barb Ripley) Dafoe, Steve Dafoe, Kathleen Dafoe, Annette (D.J.) Hartnett, Christine Jenney, Theresa (Dan Hartnett) Dafoe, and Bobbie Jo Dafoe. In addition, Frances had twenty-two grandchildren: Hilary (Karen) Dafoe, Audrey (Mark) Fairchild, Colette (David Cusano) Dafoe, Nicole (Adam Naill) Dafoe, Blaise Dafoe, Nathaniel (Marie) Dawson, Shea (Jill) Dawson, Allyson (Tim) Coffin, Tristan Hartnett, Kane Hartnett, Sullivan Hartnett, Delaney Hodges, Fiona, Danny, and Evangeline Hartnett, Delia Adams, Michelle, Matthew, Mitchell, and Melissa Jenney, and Victoria Grace; nineteen great-grandchildren, many wonderful nieces and nephews who loved her dearly. She was a member of St. Margaret’s Church in Homer, New York. A funeral Mass will be celebrated at St. Margaret’s on Friday morning, January 25 at 11:00 am. Calling hours will be held on Thursday, January 24, from 4:00 pm-7:00 pm. at St. Margaret’s Church in Homer. Burial will be held at the Glenwood Cemetery, Homer, NY.